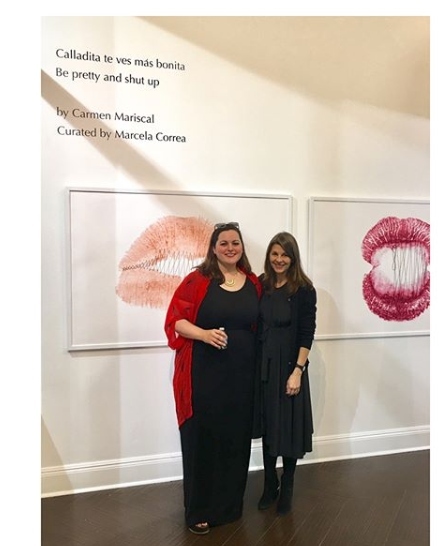 March 21st brought with it the opening of Mexican artist Carmen Mariscal’s new exhibit ‘Calladita te ves mas bonita/Be pretty and shut up’ at the Mexican Cultural Institute of New Orleans. Carmen stopped by the studio while she was in town for a conversation with us about the origins of the exhibit, her growth as a multi-disciplinary artist, and what she hopes to accomplish in her work. David Benedetto: Could you tell us a little bit about how this new exhibit came to be and a little bit about the work being presented? 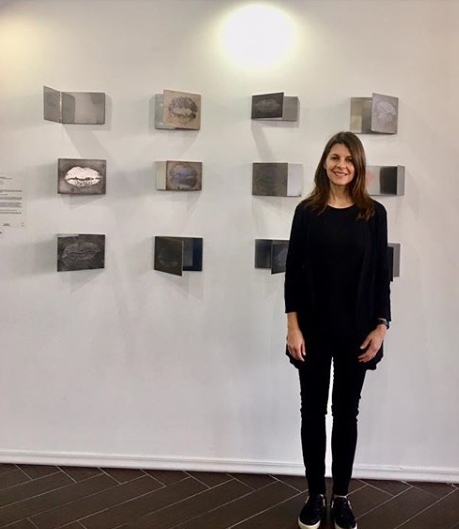 Carmen Mariscal: I was invited to present this exhibition in 2017 when I came [to New Orleans] for a group show at the Newman school and I met Belinda [Flores-Shinshillas]– who’s another Mexican artist– who was working at the time at the Mexican Cultural Center. She and the [Mexican] consul invited me to come and do a solo show, which I [then] created especially for New Orleans. The theme of the show is women’s voices — or lack of women’s voices. I worked with many women in Paris for a project that ended up in an exhibition in the fall, and I wanted to continue working with communities of women. So I worked with women in Mexico and Paris. And women in Paris come from many different countries: Africa, Syria, Pakistan, France, Italy, and Bulgaria. And I arrived here a little bit early to interview and ask women from New Orleans to participate in this project. So it’s a project that has voices and participation from New Orleans women and that was important for me. DB: How would you describe the exhibition itself? CM: The exhibition is composed of two bodies of work. One is called “Coiffes,” which means “headdresses.” So they’re self-portraits with different headdresses made out of barbed wire. And the next series is the one that was done specially for this exhibition and it’s called “Calladita te ves mas bonita.” You have that expression in the U.S. that is like sit still and be pretty, but the literal translation is shut up and be pretty. DB: Interesting! Reading up on you and going to your artist statement that you have on your website, one line really struck me, “We all walk around bearing the weight and power of memories. My intention is to show the power these memories have over us to make the invisible memories visible,” and just from that description right there I see you taking these persons, these ways of looking at people and really making it visceral. What was the process for you in working with this exhibit and figuring out these concepts? CM: I’ve been working for many years with this. So what you were just saying about the memory and the weight of memory — traces are like imprints of memory. So in a way the women’s lips are traces like a fingerprint is like a print on like an etching. And they carry the memory of each woman. And for me what was very important was to give these women a voice. So that was one of the most important things for me in this exhibition. DB: What do you hope people get out of this exhibition? CM: The works of art are a space where people can question their own lives in their own society. So more than giving them something to think that is processed, I want them just to be there. Listen to the other women’s voices. Listen to their testimony– because there’s a sound installation that accompanies the exhibition — and just question what about society has not let them or the women around them or men — because I mean I focused this time around women, but there are also a lot of things that society doesn’t let men talk about. And it’s just creating a space for dialogue and for questioning. DB: How would you describe your working techniques or discipline? CM: I work with a lot of disciplines: installation, photography, sculpture, theater set design, [and] sometimes video. So it’s very big. And I was always thinking, “Well, if I’m always switching techniques how am I ever going to really get good at that technique?” And then I came to the conclusion that for me the most important thing — at least in the work I do — is the question. What do I want to talk about? What is the material or the means or the technique that would be better to express that idea or that questioning? And so what I want to get better at is choosing the right media to express the question that I have or the idea that I have. And I’m always learning. I work very hard at learning to make the things myself. And when I can’t do them myself, I work next to an expert. And that expert teaches me. So I try to get better and better. DB: Do you ever get slumps in your creative output? CM: I always have more ideas than time and more ideas than places to show them. I’m trying to find a home for it, trying to find the right public or venue for it. Sometimes you go and knock on a lot of doors and sometimes things don’t happen. And maybe you can wait many years and nothing happens. But I think just creating and working in your studio every day and just trusting that whatever you have inside has to come out [and] has to see the day. No matter if it has a venue right there or not. I think an artist has to trust that one day, in some way, the right venue or the right public or the right space will come along, but [until then] just work and work and work every day. The exhibit will be on display until May 24th 2019. The Mexican Cultural Institute is located at 901 Convention Center Blvd. Suite 118 and open Monday to Friday from 9AM to 5PM. More information about the Institute can be found here. More information about Carmen can be found on her website.